Well I've had the new telescope for a week now and tonight was the first cloudless evening! So I double checked the red spot finder again and set up in the garden at 8ish to check out the moon in day light. Brilliant!!! the clarity was really good. The 13mm eye piece caught more detail than I've ever seen. Vega was out first as usual but too near the zenith to see. I started to try an auto align on Altair then gave up when I spotted Saturn. Second wow moment of the evening! Then the clouds came rolling in! The attached is an afocal with a mobile phone. Not sure what the shadow was but it went after the moon views. Nice scope - I can appreciate why you're pleased with it. I think you can sometimes get a shadow like that if your phone camera is positioned too close to the eyepiece. It's actually the shadow of the secondary holder, but if you hold the phone slightly further back from the eyepiece it should disappear. You can get a cheap and cheerful adapter to hold your phone in position against the eyepiece for very few ££, though centering the image can be a bit hit and miss, so you may prefer to get one with fine control screws - which will cost a bit more. Yes, The image problem is a classic case of 'vignetting'. Normally zooming in and physically pulling the camera further away can solve the problem. Buying a relatively cheap 'webcam' type with a 1 1/4" nose is a far better solution for lunar and planetary photography. A telescope of that size is capable of capturing incredible details with even a basic imager. You are bound to 'discover' all kinds of objects in the night's sky with that telescope. There is enough to keep you busy for a very long time with it. Congratulations. Second clear night this week so I had to set up in the garden again. I failed three times to align the thing using Sky Portal on the iPad. But I did have a look at the moon and Saturn again and managed to find M13, M57, Albireo and by then Mars had risen. It seems that if you loosen the clutches, tell the scope to goto a known object with Sky Portal, then line up the red dot to the same object and retighten the clutches. Then goto some other object with Sky Portal, the scope will go to it! But it wont track. I found M2 and M15 from Altair in this way! Neptune was up but the neighbour's house was in the way. After further Googling it seems the dark patch in my moon photo could be a shadow of the secondary mirror, an artefact in the SCT when used with a low power eye piece. If this is the case then it seems odd that the Evolution would come with a 40mm eye piece. Unless there is something new happening that I don't know about, then you don't need to touch the clutches to align the mount. I don't know anything about iPads and 'star sense'. If you can't get it working then for now (I assume it gives you the option to manually align), then 2 star align on say Altair and Vega, and off you go! Eyepieces with large focal lengths, and/or focal reducers can also introduce vignetting. However it isn't normally a problem unless you add a focal reducer or similar. A 40mm lens may show faint vignetting on a full screen bright object like the moon, but won't be noticable on other objects. From what I've seen there's not much chance of that! I was just playing with the clutches experimentally and in retrospect it was probably the reason why it wouldn't align because I loosened the clutches to slew between align points! Aratus wrote: As we said, the 'shadows' are caused by vignetting, when the light rays are blocked at certain points in the image. I'm ok with the causes and principles of vignetting, it's the experience of using an STC that I'm at the beginning of the learning curve with. The moon picture I posted was a quick grab just to post something up in my excitement. I'm not bothered that it's a rubbish picture! I expected the vignetting around the edge of the picture, that always happens using a mobile phone up against the eye piece. What I didn't expect was the shadow of the secondary mirror in the centre of the image. It's not an aspect of vignetting that I was aware of. I first noticed it it during the day as an annulus whilst setting up the red spot finder, but only with the 40mm eyepiece and not the 13mm. 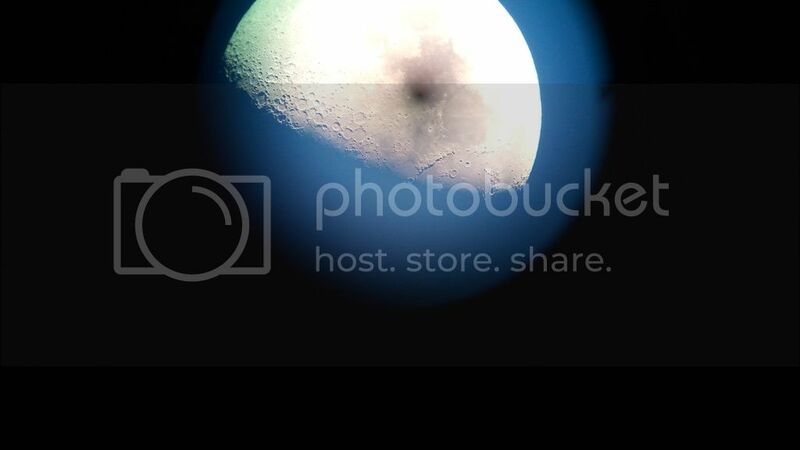 Then again whilst observing (and imaging) the moon as a central blob as can be seen in the photo. Once I get the alignment and tracking sorted I'll get the DSLR out but until then I'll just keep enjoying the views! FWIW I have a 32mm EP that doesn't show a central shadow with my 8" SCT. Gfamily2 wrote: FWIW I have a 32mm EP that doesn't show a central shadow with my 8" SCT. Yes, my first dob eyepiece is 32mm, I'll try that. My zoom is 8mm-24mm, they're put away at the moment whilst we're in the process of selling the house. Do let us know how you get on with the zoom - I'm half tempted, but I wonder if they'll depend on really good skies to go shorter than 10 or 12mm. The other thing is that I've already got a 26mm, an 18mm a 10mm and a 2x barlow, so I don't really need one, but it would be interesting to hear what you think of it with an SCT. Haven't used it on the SCT yet but I used it all the time on the dob and I love it! It gives you the ability to find things at 24mm and zoom in without the hassle of changing and risk of dropping eyepieces. Composure is a doddle and focus generally stays true(ish). There is a reduction in quality at 8mm but you might expect that and overall that is acceptable when weighed up against the pros. Once zoomed in, a change to a higher quality eyepiece would of course be possible.